Fish – Traditionally, a pair of fish is used. 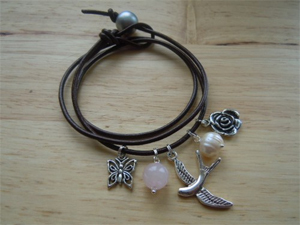 If you can find a charm with mother-of-pearl, this is ideal. Goat – This symbol is sacred to the Horned God and Aphrodite, and is suggested to increase fertility when worn by those with a Capricorn sign. Ram and Bull – Both of these horned animals symbolize fertility, vitality and strength. Unicorn – Although fictional, it has long been said that wearing amulet jewelry that is unicorn-shaped will increase your chances of getting pregnant. Fertility Deity – A fertility deity is traditionally a goddess, but sometimes a god, in mythology associated with birth, pregnancy and fertility. There is a very long list of deities, and although you can find some very specific ones made into charms, most will simply be the symbolic shape of the goddess. Some of the more popular deities include Ashanti, Damara, Isis, Artemis, Hera, Haumea, Mama Ocllo, Anjea, Akna, Freyja, Diana and Venus. Ankh – This Egyptian cross is an ancient symbol of life. It represents both eternal and physical life, and has become a popular symbol seen in fertility charms. Kwan Yin – This female Bodhisattva is a Chinese goddess of compassion believed to have the power to grant children to those she feels are deserving. Pertho Rune – This symbol is said to increase fertility, but also eases the pain of childbirth. It is often paired up with aquamarine as this is its associated color. Kokopelli – Although fertility deities have already been discussed, Kokopelli deserves a mention of his own. His roots stem from Native American cultures, and he is typically depicted with feathers coming out of his head and humpbacked, as he plays a flute. Yoruba Beads – A pendant made with these African beads is one any female would love. These beads can also be found in full necklaces as well as strands long enough to wear around the waste. If you and your partner have been struggling to get pregnant, try a fertility charm. No one will care if it is not considered traditional push present etiquette to give when the bundle of joy arrives.